As a society, we are obsessed with food. With copious food blogs, celebrity chefs and reality cooking shows, food has become more about our social status and self-identity than about nourishment. Food has always been intimately connected to our health and well-being, and the modern food obsession has taken that to extreme levels as well. Organic, paleo, sugarless, raw food, cleansing and other popular diets have morphed into ‘movements’, the polite shorthand way of describing popular obsessions that are borderline cults. Trying to cash in on this wave of cultural orthorexia is Dr Caroline Leaf with her latest book, “Think and Eat Yourself Smart”, published in early April by Baker Books. And that would be fine in theory, though in practice, Dr Leaf uses the book more as a vehicle for divulging her personal food preferences and her socio-political ideology while recycling most of her dubious brain science. But before we go any further, let me issue a disclaimer: There’ll be some who will look this review and assume I’m being critical of Dr Leaf’s book for the sake of being critical. I recognise that I’m not Dr Leaf’s number one fan, however, I want to say from the outset of this review that I have approached this as dispassionately and objectively as I can. “Think and Eat Yourself Smart” is certainly not all bad. Dr Leaf raises some legitimate issues. For example, she’s critical of the vitamin and supplement industry and the staggering cost of supplements compared to their very limited benefits. She discusses the previous dietary advice regarding low-fat foods, and how the misguided attempt to reduce our dietary fat intake lead to a compensatory increase in starch and sugars. She also discussed the current concerns about too much sugar and refined carbohydrates, and raises the very real problem of food waste and food security. The recipes at the back of the book contain the usual over-rated hipster foodie ingredients like dandelion, kale, quinoa and chia seeds to maintain Dr Leaf’s foodie creds, although some of the recipes themselves sound alright. Unfortunately, every truth is outweighed by a multiplex of factoids and misrepresentations. Dr Leaf clearly favours organic food, which despite her claims, have not been shown to be better tasting, more nutritious, less toxic, and better for the environment. She’s clearly against genetically modified organisms (or GMO’s), a stance which is more populist than scientific. Dr Leaf’s definition of “real food” is nothing more than a romanticised post-modern social construct, and claiming it’s God’s idea doesn’t make it any less misleading. Of course we want our food to be fresh, and we also want it to be nutritious. But fresh and nutritious are not dependent on being local, seasonal, ecologically diverse (whatever that means), grass-fed and wild. In fact, how something can be grass-fed and wild seems contradictory. Processing food makes it safer, and in most cases, more nutritious that the unprocessed farm gate versions. There’s virtually no pesticide residues left on conventional produce either, so that’s a moot point. In fact, modern food is actually easier to eat and digest, more nutritious, tastier, safer, and longer lasting than ever before in human history. Today’s canned and frozen foods are infinitely healthier than in the past, and in some cases, more nutritious than the vegetables straight off the farm (canned tomatoes, for example, because nutrients are more easily absorbed from cooked tomatoes). Dr Leaf’s idealised view of our agrarian past is false, and the notion that we should return to it is inane. Again, this is a false premise based on bogus science. 75 to 98% of current mental, physical, emotional and behavioural illnesses and issues do not come from our thought life. What you think and how you feel makes no difference to how your body processes the nutrients you put into it. This excessive focus on the power of thought is a segue back to her previous teaching, a justification as to why she as a self-titled cognitive neuroscientist should be writing about food. Unfortunately, the information contained in the second part of the book makes it obvious that she’s not an expert on either. Sure, Dr Leaf discusses responsibility and choices which are important to what we put in our mouths, but there are so many other variables that are more intrinsic to our individual diets than just personal responsibility. Like, poverty, income, education, cooking skills or geographic location for example. Dr Leaf claims that how you think changes how you eat, and how you eat changes how you think. Except the last part of that statement is mutually exclusive to her premise that the mind is separate to the brain and controls the brain. What you put in your mouth might change the function of your brain, but how can that change the way you think if the mind is separate to the brain? This paradox is the death-knell to her books credibility and usefulness. Not that it makes any difference to Dr Leaf, who conveniently forgets this central tenet of her teaching whenever it suits her. The advice she provides is also off-track. The answer to processed food isn’t to plant your own garden, or raise your own chickens, or join a local agro-economic food co-op. That sort of advice is impractical for the vast majority of her audience. It excludes everyone who lives in a modern city, or who, like me, has an uncanny ability to kill all but the hardiest of plants. Even her exhortation to eat “real food” is unnecessarily complicated. Ultimately, Dr Leaf’s advice isn’t dangerous, but just old and confusing. Most of the useful information she gives is obscured by the plethora of unnecessary and irrelevant opinions and factoids. It’s also nothing new. There have been countless books and blogs written by real nutritionists and dieticians that say the same essential things in much simpler ways. Even John Oliver did a better job of explaining problems associated with sugar and our modern food systems (* Warning * – Strong language and adult themes). He’s an agnostic satirical comedian who doesn’t pretend to be a scientific expert, and he still get’s the message across more effectively than Dr Leaf. To conclude, if you want sound nutritional advice, I’d suggest you head for books by actual dieticians. Professor Rosemary Stanton is one author I would recommend. She’s a Professor of Nutritional Science and Visiting Fellow of the School of Medicinal Sciences at the University of New South Wales. She’s published hundreds of academic and consumer articles including 33 books on good nutrition. She’s been lecturing and writing about good food for longer than I’ve been alive. 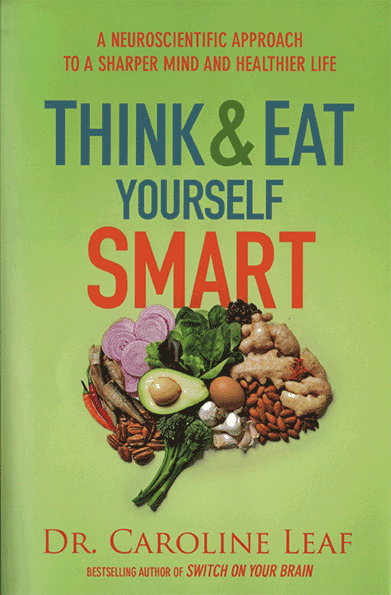 In contrast, Dr Leaf’s book “Think and Eat Yourself Smart” is a repackaging of stale opinion and dubious science by an author who isn’t a nutritionist, or even a cognitive neuroscientist for that matter. There might be some helpful advice in there, but it would be difficult for an average reader to pick out what’s beneficial and what’s bogus. To that end, “Think and Eat Yourself Smart” is a lot like a frozen microwave dinner. It looks good on the packaging, but what you get on the inside isn’t the same. There’s a few nutritional morsels, to be sure, but most of it is just offal and gristle that’s been homogenised to an unrecognisable mush and then reassembled. If you’re a Dr Leaf devotee, or you’re interested in her socio-political views, then by all means, buy this book. If you want sound nutritional advice, look elsewhere. This entry was posted in Biological, Caroline Leaf, Psychological, sugar and tagged caroline leaf, cognitive neuroscientist, criticism, diet, farm, food, fresh, genetically modified food, John Oliver, Michael Pollan, nutrition, organic, processing, sugar, think and eat yourself smart by cedwardpitt. Bookmark the permalink.